conversations.He understands everything we speak and responds to it as well.He can speak sentences with proper grammar most of the times and we just keep getting surprsed at the vocabulary he has and the variation of his tone based the context , situation. After coming home from day care, he explains about little things about his day and also different ways he interacted with each of the kids in day care by mentioning their name. 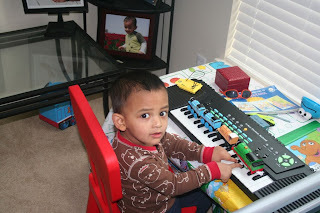 His favorite programs are "Dora the explorer", "Go Diego Go" and most imporantly the episodes of "Thomas & Friends". 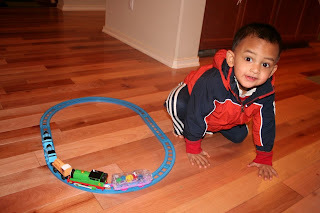 Just like lot of boys, his toys interest is completely around trains, trucks and cars. He knows each and every character in Thomas program and he is not tired watch those episodes even after 100 times. He also likes to read about Hanuman, Krishna, ramayan, Mahabharata. 1. "Good job mummy" when we do something difficult (for him). Also words like "my god", "my goodness"
2. "This is not the time to sleep", "This is not the time to brush"
3. When we give him punishment through "Time outs", he says 'mummy, i want to give a kiss". This is his favorite act to cool people down. 4. Sings "sa ri ga ma pa da ni sa"
5. "Mummy, i want to reach aeroplane, i want to jump and catch it"
5. He knows sevral character names in Ramayana, Mahabharata, krishna story (rama, seeta,hanuma,jayau,arjuna,ksishna,jambavanthudu etc). 6. Saying "No , Never" and laughing cutely like a villain "ha ha ha ha"
7. When Chandra was going on downhill one day and had to do a sudden break, he said "careful daddy, you will get timeout". He knows when he is going uphill and when he is going downhill. 8. We have a poster with good boys habits. He looks at the poster and explain each of the habits. nenu korukunna" from "avakai biryani"
10. when we give him water and he doesnt want it , he sayd "mummy, too much water". He also uses "too much" in other contexts such as "I love you too much mummy". 11. One of the things I love is , if we wear new dress or something, he comes and tells "you are looking so cute mummy, you are so nice mummy". Humming the "ringa ringa" song from slumdog millionaire and slowly tranisitioning that song to "ringa ringa roses"
putting dress to daddy with towel and saying "daddy has a new dress"